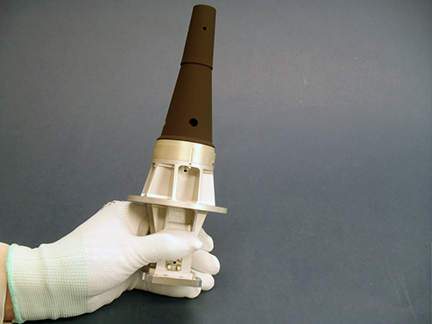 A new, high-power antenna the size and shape of a large ice cream cone will serve the data downlink needs of the coming generation of European Earth Observing (EO) satellites as they gather ever larger quantities of environmental data. Despite its compact size, this antenna provides sufficient bandwidth and power handling to fly aboard the MetOp Second Generation, Copernicus Sentinel-6 and Biomass satellites. Earlier versions are already in service on the recently launched Aeolus wind mapper, and the RapidEye satellite constellation. This new quadrifilar helix antenna for data downlink will serve Sentinel-6 and Biomass. It was developed through an ESA General Support Technology Program contract with RUAG in Sweden. Photo is courtesy of ESA/RUAG. EO missions, typically moving in close, rapid orbits around Earth, rely on what are called ‘isoflux’ antennas to relay their results to terrestrial ground stations — meaning their signal beam patterns are shaped in such a way so that the signal strength remains constant no matter what angle they are picked up from. Previously, such patterns have been achieved with 40 to 50 cm. diameter antennas — tough to accommodate aboard smallsat platforms. As an alternative, this new quadrifilar helix design is just 26 cm. high by 10 cm. in diameter. A quadrifilar helix is a cylindrical antenna with four strands of wire wound in a tight corkscrew. Isoflux coverage with this antenna is obtained through careful tuning of the geometrical parameters — length, diameter, pitch and the number of turns. Slight adjustments are all that is needed to serve a wide variety of satellites operating at different altitudes. First introduced in the 1970s, such helix antennas have been employed extensively for telemetry, tracking and command purposes — downlinking satellite telemetry and receiving commands uplinked by ground controllers. 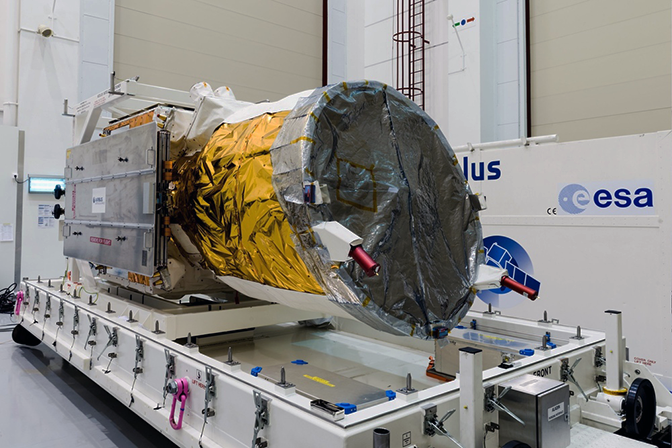 Aeolus's two data downlink antennas, based on a quadrifilar helix design, housed at the end of the satellite's telescope housing, seen here at the Airbus Defence and Space facility in Toulouse, France, with red protective coverings. Photo is courtesy of ESA - M. Pedoussau. View any picture of an EO satellite to see a pair of these helixes — plus protective coverings — extending from opposing sides of its body. If contact with a satellite is lost, the aim is that these antennas can be used to re-establish control from the ground, from any direction. ESA antenna engineer Peter Rinous explained that while Earth observation satellites are acquiring much more environmental data than in the past, their actual satellite platforms are trending smaller. The need became clear for a smaller, more powerful data downlink antenna. ESA identified the quadrifilar helix antenna as a promising design to push forward on. The idea of harnessing these helix antennas for higher-frequency, higher-bandwidth data downlink instead goes back to the first generation of MetOp weather satellites at the start of the century. These large satellites host a variety of different antennas, including several low frequency helix antennas for data and search and rescue services; some with isoflux designs. What the mission team didn’t know beforehand was how well these helix antennas would operate in close conjunction on the satellite platform — would there be interference? Ruag's quadrifilar helix antenna design for data downlink, including a signal polariser, radiator that send out the signals, covered with a protective radome. Image is courtesy of ESA/RUAG. Peter continued by stating that to complement their computer simulations, Airbus Defence and Space built a scale model of the MetOp satellite incorporating scale model helix antennas working at higher frequency to make up for their smaller size. 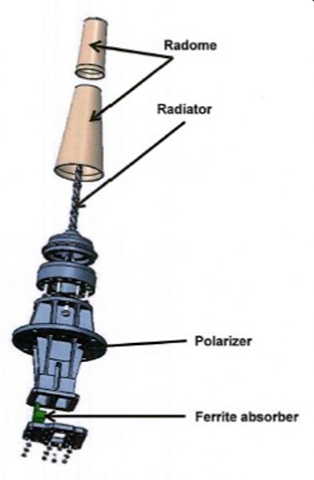 Once these scaled-down designs were seen, ESA had the idea: why not make working versions of these smaller quadrifilar helix antennas for space, operating at the higher frequency? The first output of the resulting development project ended up aboard Aeolus — although the wind-mapper’s data downlink requirement is comparatively low compared to the follow-on missions the next version of this antenna will serve. Peter concluded by saying that this recently completed work by RUAG extends the antenna’s capability further, rendering it ready for a variety of future missions. This is really the role of ESA’s technology program: to ensure the correct technology is available at the correct time for missions to come.